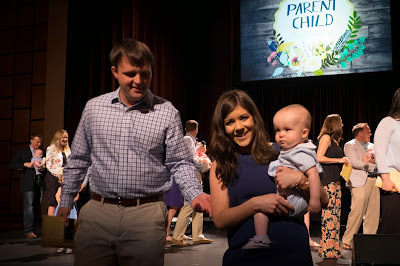 Today we dedicated our precious boy to the Lord. It was a wonderful moment for our family and made this day feel extra special. My parents, Scott's parents, and my Grammy were all there to witness the moment and I'm so glad. Campbell is one loved little boy. His grandparents would seriously figure out a way to purchase the moon for him if he asked. It makes my heart so happy to see him so loved by so many. And he loves, loves his grandparents so much. They are all a wonderful example of what it is to know and love the Lord and I am so grateful that he will always have that in his life. 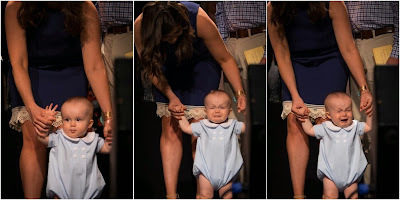 Campbell did great during the dedication. I honestly don't feel like I was able to enjoy it because I was on edge the entire time and worried about him getting fussy. But we had a plan....they're called cheerios.....and they worked like a charm. The pastor walked up to every child dedicated and said a prayer over them. When he walked up to Campbell, he said a little prayer then pat Campbell on his back and under his breath he said "I'm praying for you little Campbell." Campbell looked at him, nodded his head real big and said "Mmm Hmm." Oh, it melted me....and the pastor too I think! My Dad got it on video and I'm so thrilled. It was the sweetest thing. It's like Campbell knew what he was saying to him and was responding with "thank you for praying for me." All was good in Campbell's world until the dedication was over and the entire congregation decided to do a round of applause. He didn't like that. 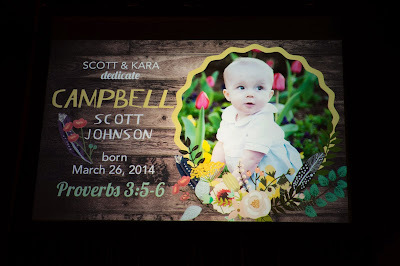 Our greatest hope is that our precious Campbell loves the Lord with all of his heart, soul and mind. We pray that Campbell seeks Him in all he does. We pray Campbell is passionate about the Lord and has a close relationship with Him. We pray that Campbell will be a rock and godly leader for his future family. We pray that he will abide in Christ and look to His Word for all areas in his life. I pray that Scott and I will be a strong example of what it is to know and love Christ. I, especially, pray that Campbell will look at me as a godly woman. I want him to know that I'm not perfect and I have sin. But I am redeemed. I want Campbell to love God and love the church. I want Campbell to feel like every time the doors are open, we're there. I want Campbell to know that the rock and foundation for our family is in Christ alone. Our hope is found in Him. Campbell is super lucky to have such awesome parents! Proud of you all!